• J.S. Bach: Aria (from Cantata 12, "Weinen, Klagen, Sorgen, Zagen"). Arthur Lourié (37) provides an important list of eight transcriptions from which most of this section is drawn, with this work as the first alphabetically. However, no trace of this transcription has survived.35 It's a confusing ascription. If indeed Koussevitzky played an aria from this Cantata, which one? The six movements of the Cantata include an opening Sinfonia and two choruses; these choruses frame the three central arias. The alto aria, "Kreuz und Krone sind verbunden," requires an obbligato oboe. The basso aria, "Ich folge Christo nach," lasting little more than two minutes, is quite brief to be performed as an independent item. The tenor aria, "Sei getreu," requires an obbligato trumpet playing the chorale melody "Jesu, meine Freude." In fact, the most likely candidate would be none of the arias, but rather the Sinfonia, widely played as an oboe solo with piano accompaniment. Such an error would also be parallel to referring to Scriabin's Etudes as Preludes (discussed below). Given this uncertainty, it is also possible that Lourié inaccurately referred to another work by Bach. One likely suspect would be the Air from the Orchestral Suite no. 3, already famous in Koussevitzky's day as August Wilhelmj's transcription "Air on the G String" and available in a further transcription by Franz Simandl.36 This would however assume Lourié turned "Air" into the Italian "Aria." Could it be the Arioso from Cantata 156, widely played as a transcription for cello and piano, with a different twist of title? Since the first publication of this transcription appears to be that of Sam Franko (G. Schirmer, 1915), this would be a bit late in the game to be a regular item in Koussevitzky's repertoire. Even if he included it in his Russian programs of 1917-20, getting sheet music from the U.S. during World War I and the Russian Revolution would be quite a challenge. Another possibility is the famous aria "Schlummert ein" from Cantata 82 which, in addition to having an identical title of "Aria" rather than the variants of "Air" or "Arioso," holds out the additional connection that "82" could easily be misread as "12." Moreover, this Aria was included in a volume edited by Ebenezer Prout and published by Augener in 1909, so Koussevitzky had ready, timely access to material that could rather easily be converted for his purposes. Since we have neither any copy of the transcription nor any program that lists the work, we can only speculate. • Ludwig van Beethoven, Minuet in G, WoO 10, no. 2. 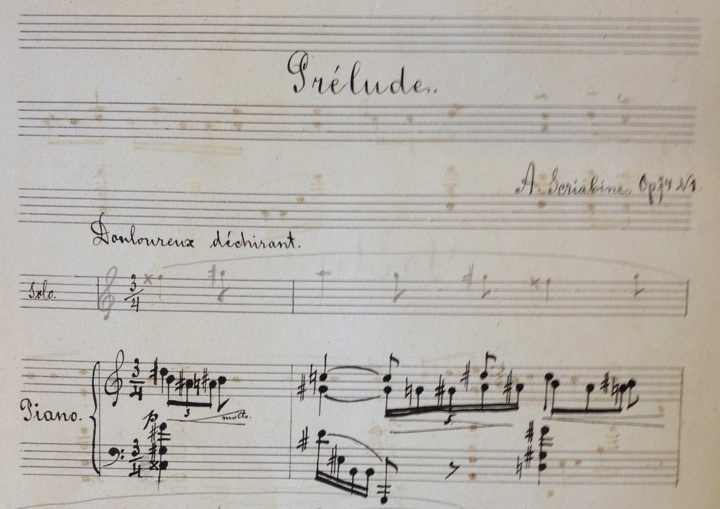 Koussevitzky's manuscript piano score, with performance notations, is in BPL (Figure 6). He included this piece in his Italian tour of 1920-21 as well as recording it. • Max Bruch, Kol Nidrei. Koussevitzky's manuscript piano score is in the Library of Congress and is reproduced in Stiles, Compositions, 105-16. While most modern bassists perform the piece in the original key of D minor, Koussevitzky's performances, which began in Russia, continued in Berlin in 1903, and were repeated extensively thereafter, were in A minor.37 Despite the change of keys and the resultant need for a transposed accompaniment, he performed the work both with piano and with orchestra. The orchestral material has not been located. • Henry Eccles, Sonata no. 11. Koussevitzky performed at least the opening movement of this sonata in his Italian tour of 1920-21. 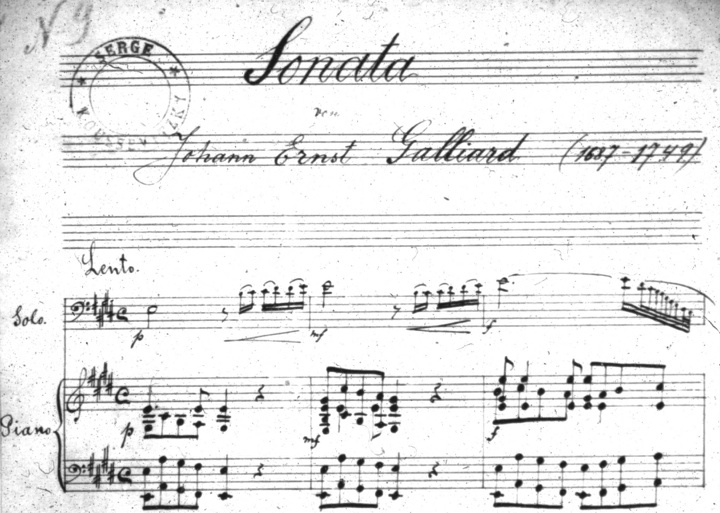 The manuscript piano score, which is a transposition of Alfred Moffat's edition for cello and piano in order to accommodate solo scordatura, is in BPL (Figure 7). Moffat's edition (Figure 8), is still in widespread use, and is also the basis for the editions for various instruments published by International Music Company, which is what most modern bassists use. All four movements of Koussevitzky's manuscript show performance indications. Koussevitzky recorded the first movement; although the 78s included only one take, two takes are available on the Biddulph CD. This piece illustrates a common strategy in Koussevitzky's transcriptions: reading the original part with a change of clef. In this case, the tenor clef of the cello part is read in bass clef: that is, in c minor. The scordatura transposed the result to d minor. The Bruch can be performed the same way. Another strategy is used in pieces including the Galliard sonata, discussed next. • John Ernest Galliard, Sonata. Koussevitzky included the opening movement of this sonata in his Italian tour of 1920-21.40 The manuscript piano score is in BPL (Figure 9). It transposes a composite sonata published by Alfred Moffat in 1904 (Figure 10) from F down to E (the bass playing in D, with solo scordatura). Moffatt drew from two sets of cello sonatas, substituting the third movement of a sonata published in 1746 within a sonata otherwise published in 1733. He probably considered the original third movement, which is little more than a brief recitativo, insufficient. Frederick Zimmermann's International Music Company edition of 1949, the usual source for modern bassists, retains Moffatt's substitution. Koussevitzky transposed the piece by a mere semitone to a much more comfortable key for the bass, as he did also with the Mozart Concerto and (I argue later) the Handel sonata. The Rachmaninoff Vocalise is transposed by a whole step, from c-sharp minor to b minor. • George F. Handel, Sonata in F-sharp (for violin). Although one might suspect that this work is an inaccurate citation of the Handel Oboe Concerto that Koussevitzky more often played, this is a distinct transcription, included in recitals as early as 1903; reviews specify that is was originally for violin.41 But which Handel sonata is it? Since Handel wrote no sonatas in this key, Koussevitzky must have played a transposition. Alas, no trace of the score remains. However, we can at least consider the possibilities. The program of Feb. 12 1907 lists the movements as Adagio, Allegro, Largo, Allegro, which reduces the options considerably.42 The most likely possibility would be the (spurious) Sonata in F, HWV 370, a popular piece that lies rather well when transposed in a manner parallel to Koussevitzky's version of the Galliard Sonata. Other violin sonatas that have this order of movements, and which are therefore potential candidates, include the (spurious) Sonata in A, HWV 372 and the (spurious) Sonata in E, HWV 373. (Of course Koussevitzky would not have known that later scholarship would prove each of these sonatas to be misattributed; he thought he was performing genuine Handel.) The Flute Sonata in B minor, HWV 376, also has the requisite order of movements, but it seems unlikely the concert reviewers would have repeatedly called it a violin sonata. • Handel, Oboe Concerto in G Minor, HWV 287 (ca. 1704-5). This transcription is drawn from Franz Simandl's famed Hohe Schule series, a nine-volume set of original compositions and transcriptions with which Simandl completed his published course of training for the double bassist: a core solo repertoire for the bass. The bassists who served as composers and editors for the series were among the most distinguished in the world. A rich resource for bassists of that period, it has been in use ever since, albeit often in other publishers' reprints and new editions. More recently yet, the entire historic series, long out of print, has been reissued in 2014-15 by the original publisher, previously known as C. F. Schmidt, now known as CEFES. Koussevitzky's copy of this piece is housed in BPL and is rich with performance indications. A card tipped into this copy and tacitly referencing Smith (20) indicates that this is the work he performed in Moscow in 1904; The Musical Courier and other sources demonstrate that he performed it often, both with orchestra and with piano. He also was known to perform the third movement, the Sarabande, as a separate number: specifically, on receiving his honorary doctorate at Brown University in 1926. Koussevitzky owned the entire 4th volume of the Hohe Schule (comprising six works under individual covers), from which he also performed the Lvovsky and perhaps performed the Hegner, each listed below. It is surprising, given his obvious preference for works by famous composers, that Koussevitzky apparently did not explore Simandl's 6th volume, which includes transcriptions of works by Bach, Beethoven, Mendelssohn, and Mozart — the one possible exception being if the Bach "Aria" listed above is actually Simandl's transcription. • Bretislav Lvovsky, "Drei Stücke nach Corelli." This is an item from Simandl's Hohe Schule series, volume 1. Lvovsky (1857-1910) studied with Simandl and later joined the Vienna Court Opera. Although Koussevitzky did not perform this piece often, Musical Courier cites a performance in Berlin in 1903.45 Lvovsky's three movements comprise Corelli's op. 5 no. 8, mvts. 1 ("Preludio: Largo") and 3 ("Sarabanda") followed by opus 5 no. 9, mvt. 4 ("Tempo di Gavotta"), all transposed such that the bass plays in C, using solo tuning. The piano accompaniment is therefore in D. The solo bass part of the "Tempo di Gavotta" alternates between Corelli's basso continuo line and a rewriting of the violin line in parts of the second section of this binary form. The Lvovsky is the presumptive source of Oscar Zimmerman's revision of this edition in his widely-used Seven Baroque Sonatas (Rochester: Zimmerman, 1977). Koussevitzky's copy has not been located. • Wolfgang Amadeus Mozart, Bassoon Concerto, K. 191. The score, with piano reduction and with performance indications, is in BPL (Figure 12). Koussevitzky performed this often, both with orchestra and with piano, including in Leipzig in 1908, in Moscow and St. Petersburg during the 1909-10 and 1916-17 seasons, in Berlin in 1911, in his Italian tour of 1921, and in Paris in 1921. • Sergei Rachmaninoff, "Vocalise," op. 34, no. 4. Koussevitzky's manuscript piano score is in the Library of Congress and reproduced in Stiles, Compositions, 117-21. The piece is transposed to B minor. Some bassists have entertained the notion that Rachmaninoff composed the piece for the bass and later rewrote it as a Vocalise, a tale widely disseminated by Gary Karr. The fullest exposition of this story is in Stiles, 68-69, including the incredible claim that the Library of Congress lost a page of Rachmaninoff's manuscript. The Musical Courier review of the premiere clears up this misconception. In April 1916 the Moscow correspondent, Ellen von Tideböhl, reviewed recent concerts in Russia, including Koussevitzky's concert series. She reported that . . .
Mme. Neshdanowa . . . at Kussewitzki's sixth symphony concert . . . sang the 'Vocalise' . . . with the composer himself at the piano. Kussewitzki transcribed the 'Vocalise' for his contrabass and performed it at his fourth symphony concert, so that we heard it before it had been sung by Mme. Neshdanowa." She adds that . . . The still-unstable transliteration from the Cyrillic of Koussevitzky's name is also visible in the same review article's citation of a young violin virtuoso, the 15-year-old "Yasha Heyfetz. "47 It was not until the announcement of his appointment to the Boston Symphony Orchestra, made in Vol. 88, no. 17 (April 24, 1924) that The Music Courier settled decisively on the spelling of Serge Koussevitzky. In brief, then, Koussevitzky transcribed the piece and performed his transcription before the original vocal version was premiered. Although the piece has a long and illustrious history as a bass transcription, a transcription it remains. • Maurice Ravel, "Vocalise-étude en Forme de Habenera" (1907, pub. 1909), widely transcribed as "Pièce en Forme de Habañera." Although Burghausen and Stiles list this transcription, no trace of it seems to have survived. Unusually, Stiles provides no source for his ascription; Burghausen's earlier article is, of course, an obvious candidate. • Camille Saint-Saëns, Cello Concerto no. 1. Although the large leap in difficulty between Koussevitzky's other repertoire and this work could make the performance seem fanciful, he did indeed perform this work in Leipzig in 1906, as confirmed by a contemporary review in the semimonthly, Die Musik.48 Smith (p. 31) explains that the performance in Leipzig, an "extraordinary stunt," was with a pick-up orchestra. Yuzefovich cites Koussevitzky practicing the piece while still a student with cellist friend Vladimir Dubinsky, which suggests that this performance had a long gestation period.49 The piece has recently been performed in international venues by bassist Catalin Rotaru to great acclaim. Koussevitzky's performance material has not survived. • Alexander Scriabin, Two Preludes, op. 74, nos. 1, 2. These are the works listed as "Two Etudes" by Lourié, a change in title repeated by Olga Koussevitzky and by Stiles.50 The manuscripts are in BPL (Figure 13). The copies are very clean and have the piano part in ink, the solo part in pencil, giving rise to the question whether Koussevitzky ever got around to performing these preludes. However, we have no program from Koussevitzky's Russian tour of 1916, in which this work would have been a fitting commemoration of Scriabin's death the previous year: indeed, the second Prelude was the final piece Scriabin completed. The pieces are transposed up a step, with important lines given over to the solo bass, as seen by comparison with the published score (Figure 14). Given the usual solo bass scordatura, this allows the bass to read what were the original printed pitches. Given the date of composition, Lourié is making a broad generality when he attributes Koussevitky's eight transcriptions, including this piece, to "c. 1900." • Peter Illych Tchaikovsky, Andante Cantabile (1872). Smith (11) tells us that Koussevitzky played this famed movement from Tchaikovsky's first string quartet in Tchaikovsky's rooms with the composer at the piano in 1892, when the bassist was but 18 — that is, the year before Tchaikovsky's death. However, in the absence of Koussevitzky's performance materials, the key and edition remain an open question. There are at least four contenders. Although Smith describes the performance material as Koussevitzky's arrangement, it should be noted that cellist Wilhelm Fitzenhagen transcribed the piece for cello and piano, and Tchaikovsky himself transcribed the piece for cello and string orchestra in 1888.52 Both transcriptions transpose the movement from B-flat to B. To further complicate things, Koussevitzky's professor, Joseph Ramboušek (1845 - 1901) also published a transcription for bass and piano in the key of C (Moscow: P. Jurgenson, [n.d.]). It is therefore possible that Koussevitzky played the cello part of Fitzenhagen's or Tchaikovsky's edition on the bass, or played Ramboušek's transcription. However, it seems most likely that Koussevitzky used Fitzenhagen's edition: Tchaikovsky liked it well enough that he not only took up the idea of a version for solo cello, producing his own arrangement with string orchestra, but when he did so he retained both Fitzenhagen's key change to B and Fitzenhagen's revisions to the bowing.53 Since they are so similar, wouldn't Tchaikovsky have preferred the convenience of reading a piano part over reducing even a well-known score at sight? Fitzenhagen's accompaniment is also similar to the orchestral version, especially in that he lowers the original bass line by an octave in almost all of mm. 1-49 and 98-121. Ramboušek does not, which simplifies balance but, since his solo line often drops below the bass line, Ramboušek inverts Tchaikovsky's harmony, rendering his edition a poor choice to place on the composer's music rack. Finally, even if Ramboušek's version was available in 1892, which is not certain, it is difficult to imagine a teenager approaching such a revered composer with such a beloved work, bearing either his own student effort or his teacher's transcription into yet another key.